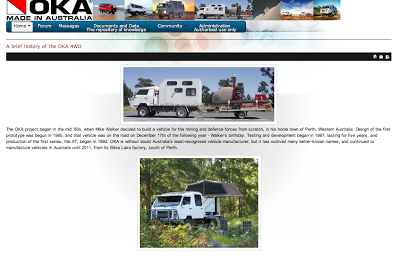 The website for Oka owners (Oka4wd.com) suffered a major crash in October 2012 causing all the forum entries, video links and some photos to become inaccessible. Surprisingly, the hosting company provides no service or tools for customer site back ups. Subsequent pressure on the hosting company did managed to get the forum entries restored but nothing else.Nevertheless, confidence in the host company has been seriously damaged so we decided to build a new and more capable website based on a more robust platform (Joomla).This is still a work in progress but the forums are recovered and back in operation and many of the technical documents have been restored. The site can be visited here or click on the photo below. We are currently working on a new social extension to the site with Facebook-like functions (although with a rather more serious aspect) which will include comprehensive member profiles, photo and video uploads, events management and group capabilities. Note 1: This new website is for Oka owners and people with an interest in Okas. It is NOT the Oka Company website which can be found here (no longer accessible as of March 2013, presumably due the intending relocation of the company to Malaysia). Note 2: In April 2013 the new site was the subject of a hacker attack on the php backend files. This took the website off the air for a few days while it was fixed and the security holes plugged.